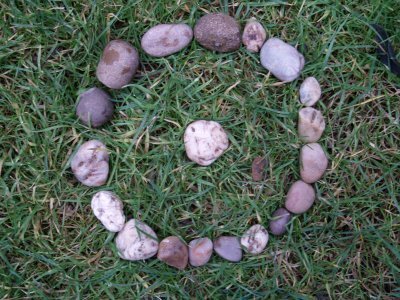 A Scout tracking symbol made from sticks or stones and taking the shape of a circle with a dot in the middle. The sign is used to show that the person laying the trail has 'gone home'. Each Scout Group has a neckerchief of different design and colours. In most countries each Scout Troop uses its own colour neckerchief. The colours are usually the "Troop Colours" which may have a particular historical significance to the troop or to the local community. When you wear your Scout Group's neckerchief you become apart of that Scout Groups family and in turn a member of the larger family of Scouting. When a member of this Scouting Family has "Gone Home" a neckerchief maybe placed into the fire to honour that individual. If anyone has a neckerchief to honour please come forward place the neckerchief into the fire, followed by the name of the individual that has "Gone Home". Repeat After Me: "Wa-kon-da dhu Waoa-dhin a-ton-he"
watch over us, until we meet again.